It's not only election season but silly season in Hoboken and while the Mile Square is not at the level of an epicenter striking like a Donald Trump, campaigns have a way of issuing fodder to create similar richter scale output. First things first; on the Board of Education front, former and current rival (by marriage) Brian Murray laid down the gauntlet to BoE Trustee Peter Biancamano at the last district meeting. 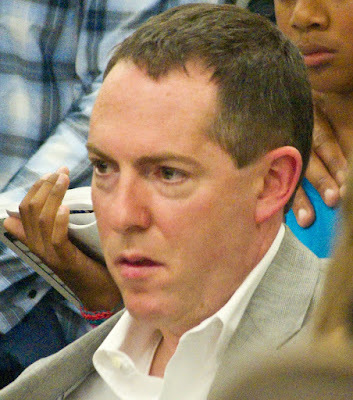 In public portion, Murray hammered Biancamano for repeatedly running for a seat on the Hoboken City Council in recent years while moving his lips saying he was committed to serving out his term as trustee and asking voters only last year to re-elect him to the school board (which they narrowly did). Murray left out his personal rivalry with Biancamano and most would not say he's obligated to do so except the numero uno reason Murray failed in his attempt last year to get on the BoE himself was one Peter Biancamano. 100 votes give or take for Murray would have gotten him the third seat. Some might color it further by pointing to a sizable pile of paper ballots for Biancamano and the Vote by mail number 466.
give their full commitment to serving the children as a BoE trustee. but this time it's for second ward City Council. Last year in the BoE election, Murray running with bomb thrower Patricia Waiters on a Carmelo Garcia ticket approached 2,000 votes, a scary proposition in itself, but he was defeated as Monica Stomwall and Sharyn Angley emerged as first time candidates to victory with Biancamano's massive VBM tally lifting him to re-election. Biancamano's been standing in the way of Murray for what seems like forever but it's actually two consecutive election cycles. The bad blood however isn't dissipating anytime soon. Peter Biancamano having successfully blocked Brian Murray from winning a seat on the BoE last year is now in a race against Murray's wife Bonnie in the second ward for a seat on the City Council. A large obstacle standing in the way of the Murrays is also one major Reform backed candidate in Tiffanie Fisher. Political rivalries however are born of the push-pull battles in elections. Here, the past is present and history may repeat itself all over again. Murray showed restraint in voicing his request while elucidating his displeasure. from the BoE the other day by former BoE candidate Brian Murray. Biancamano elected to deflect Murray's jabs. In the past he's voiced his commitment and acceptance, some might say acquiescence to continuing on the BoE long after his at-large defeat for council in 2013. That however was when Beth Mason and the Mason family checkbook stood in the way. It was common knowledge to readers here Biancamano would not or could not pull the trigger to announce a run for the second ward council seat until political reality finally dawned on Beth Mason she was through. On a contrary note, Beth Mason didn't just go quietly into the night. Before her telephone polling in the Hudson Tea Building, the second ward and later across town showed the writing on the wall, she was seeking support from distant pastures in her bizarre carpetbagging alliance with southern NJ State Senator Steve Sweeney. That became grist for the mill in state circles as Beth Mason desperately sought an endorsement for another council run from the NJ Senate Majority Leader. After much pleading and offers of Mason family loot, she was told to stop calling. How a south NJ endorsement would be of no help to Mason was clear to everyone in Hoboken and Hudson County - except Beth Mason. Chalk up another in a long list of wrong on the rumor mill churning incessantly (out of the Ruben Ramos camp) via the Hudson Reporter. Councilman Dave Mello will not be endorsing Tim Occhipinti for the fourth ward City Council seat. While Occhipinti has transformed himself (and his voting) this past year after a failed 2013 bid for mayor, similar geography in growing up and recent mutual efforts to move Hoboken forward won't lead to any surprise endorsement for Occhipinti's re-election effort. Mello just started a new teaching job and has a full plate with dwindling capacity to impact November's ward races. After noting his recent job change, he said in a phone interview last night, "I have no intention to endorse Tim (Occhipinti) and my limited energies will be going to my friend and colleague Peter Cunningham in the fifth ward." Peter Cunningham, Reform's anti-corruption champion going back to 2007 is one of two critical reform council seats up for re-election in November with the sixth ward and Jen Giattino's council seat the other. Those two council seats are considered by many close political observers as most winnable versus the historic challenges in the fourth ward where Reform typically faces an uphill fight. First time council candidate Dana Wefer will slug it out with Reform and an anticipated mayoral endorsement in the fourth ward. 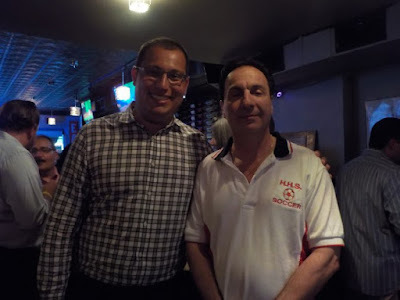 The day previous, another Ruben Ramos campaign rumor propagating the Mile Square concerned Tim Occhipinti saying he was dropping out of the fourth ward council race altogether. That rumor died a quick death when the Occhipinti campaign which may not have even heard the latest Ramos poison pill took out a campaign ad on MSV for the duration through Election Day. Nevertheless, Hoboken's rumor mill will continue to churn, churn, churn. The Carmelo Ticket is just getting warmed up. Expect more Old Guard mud flung in every possible direction. Good times. Talking Ed Note: Speaking of Mister Carmelo, reader LeoTPTP notes the Carmelo Ticket has handled the uncomfortable racial comments of Carmelo Garcia's close supporters questioned on his Facebook page as reported by MSV yesterday. The questions pointed to Carmelo Garcia' former Assembly aide's less than savory racial remarks among others have been answered - by making them disappear! If only such ugly mud-slinging racial remarks were so easily made invisible. When you enjoy having your peops play the race card ala Al Sharpton, the body politic should hold you accountable. November 3rd is long past time for voters to do so for Hoboken's Ethic Cleanser.